MSI has launched a new lineup of gaming laptops in India. It has announced three new models – the new GS65 Stealth Thin, GE Raider RGB Edition, and GT75 Titan – priced at Rs. 1,69,990, Rs. 1,64,990, and Rs. 2,99,990 in India respectively. All the three laptops feature the latest Intel 8th Generation Core processors – including one with a Core i9 processor – and are available for purchase via Flipkart, Paytm, and other authorised sellers. 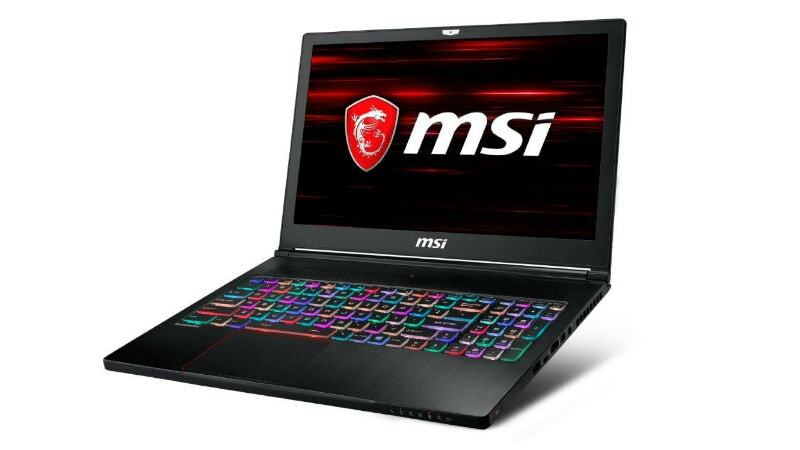 In addition to the new products, laptops across MSI’s lines are getting updated with the newest 8th generation Intel Core processors including the GP, GL and GV series. The company has also announced the opening of 21 new service centres across India. The GS65 Stealth Thin is the company’s first gaming laptop to feature a 144Hz 7ms IPS display. It has 4.9mm bezels and the screen-to-body ratio is 82 percent. The laptop comes with GeForce GTX 1070 GPU along with Nvidia Max-Q technology. It packs the latest 8th generation Intel Core i7 processor, which the company claims will provide up to a 40 percent performance enhancement over the previous generation. The laptop weighs 1.8 kilograms and packs over 8 hours of battery life. The company claims that the 82Whr battery is one of the largest batteries available in a laptop this size. The Stealth Thin also features a new per-key RGB keyboard, in which users can customise each key and receive real-time game status through keyboard lighting. The company also rolled out an update for Dragon Center 2.0 that comes with an exclusive gaming mode. The GT75 Titan has introduced the latest 8th Generation Intel processors. MSI says that it is the world’s first Intel Core i9 overclocked processor in a gaming laptop. MSI has included its Cooler Boost Titan cooling design, which helps the six-core 12-thread configuration result in up to a 70 percent performance leap over the previous Core i7. The GE Raider RGB Edition first announced at CES 2018 is a laptop inspired by sports cars. It is designed for ultra-illumination with RGB lighting on the top cover, keyboard and USB ports. The GE Raider RGB Edition is configurable with up to the latest 8th generation Intel Core i7 processor and Nvidia GeForce GTX 1070 graphics. Also, the laptop can also be equipped with up to a 120Hz 3ms panel. It comes with the MSI Cooler Boost 5, a cooling design with dual fans and seven copper heats pipes. The GE Raider comes with several features including Nahimic 3, Killer networking, Bluetooth 5.0, and more.